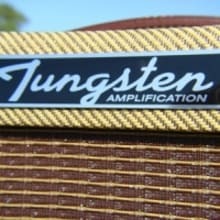 Hello, my name is Adam Palow and I am the owner/sole builder at Tungsten Amplification. Since 2003, I've been building tweed style amplifiers using custom wound Mercury Magnetics transformers, fingerjoined pine cabinets, cloth covered wire, carbon composition resistors and capacitors selected for optimal tone. Each amp also carries a limited lifetime warranty that transfers with ownership. As a one man shop I am able to select the parts that best compliment the circuit as well as each other. There's no accounting department breathing down my neck, no stockholders, no board members looking to minimize costs and maximize profits. The only person that I have to answer to is you.